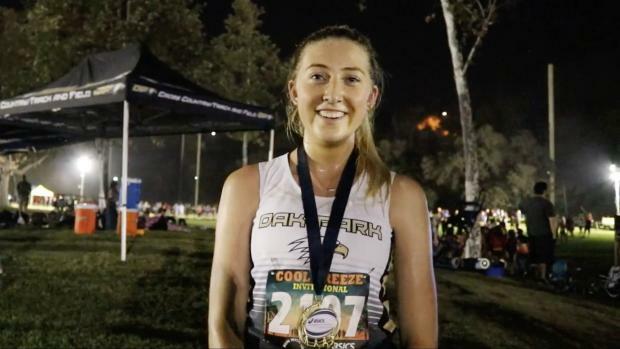 With her running partner on a recruiting trip, Oak Park senior Sarah Shulze found someone else to push her on Friday night in the dark at the Cool Breeze Invitational at Brookside Golf Course in Pasadena. Serrano freshman Tiani Goeson, sprinted to the front at the start and pulled Shulze and the rest of a huge field along for the first mile-plus. But eventually, the experienced senior, Shulze, took over, got a somewhat unexpected boost, and sprinted home a winner. Shulze's time on the flat 3-mile circuit of 16:32.2 was the fastest winning time in the Girls Seeded race in the four years since the event moved from the El Prado course. Goeson was second in the 254-runner field in 16:39.6. In the Varsity Boys Seeded race, junior Dylan Wilbur became the third consecutive winner from nearby Crescenta Valley, following victories by former CV standout Colin Fitzgerald in 2016 and 2017. Wilbur's finished in 14:26.7, narrowly defeating Golden Valley senior Daniel Rush (14:27.7) and Concord De La Salle senior Connor Livingston (14:28.1). Livingston, a standout from the North Coast Section, had been 98th and eighth the previous two years. As was the case with Shulze, Wilbur's time is the fastest on this course in the meet's four-year run in the shadow of the Rose Bowl. Fitzgerald's winning times each of the last two years: 14:55.91 in 2016 and 14:52.80 last September. Claremont coach and meet director Bill Reeves did anticipate faster times after adjusting the course to remove two 180-degrees turns and to convert three turns, making them wider. The marquee competition to end the night at the 16-race invite, is called "Sundown Showdown" yet both went off more than two hours after the sun set over the Arroyo Seco valley along the northwest end of Pasadena. Despite portable flood lights across the course, it was difficult at times to navigate through the darkness, Shulze said in our exclusive interview. Shulze, who said she is leaving on her first recruiting trip on Saturday morning, said classmate Sylvia Cruz-Albrecht missed the meet while she was visiting Yale on the East Coast. That Oak Park senior tandem is among the elite girls distance runners in the state. She ran second to Cruz-Albrecht at the CIF-Southern Section Division III finals last fall and fifth (two places behind her teammate) at the State D-III final in Clovis. On Friday night, Shulze got a little surprise to help the memorable start to her senior season. "I kind of had almost a second wind in the last mile, so I just sort of went for it the last mile," Shulze said. "I'm really happy with how it turned out." But she had to withstand a lightening-quick start and rapid early pace from Goeson. "The freshman, Tiani, was pushing the first mile and it was really, really crazy," Shulze said. "I was very impressed." Chino Hills sophomore Jacqueline Duarte was third (16:53.5) in the Varsity Girls race with Colony sophomore Amber Rios fourth (16:54.7) and Claremont senior Sydney Hwang fifth in 16:55.8. Valencia junior Hailey Kirsch was the only other girl to dip under 17 minutes in this field, crossing in sixth in 16:58.0. Over the last four Cool Breeze Invites, an event hosted by Claremont, Hwang is gone from placing 74th (19:32.54) as a freshman to eighth as a sophomore and now top-five the last two years with a significant time drop each year. Hwang led Claremont to another team title. The other top-four finishers for Claremont were senior Kalinda Reynolds (11th, 17:13.8), junior Azalea Segura-Mora (15th, 17:17.8), sophomore Angie Gushue (18th, 17:20.6), and senior Julia Marriott (30th, 17:52.0). Senior Aaron Reyes was seventh as the top finisher for Claremont (14:39.4) with senior Ryan Cowgill (14:49.0), senior Vicente Huerta (14:49.4), sophomore Jack Keough-Lansford (14:50.6) and senior Jacob Moran (14:55.1) completing the nationally ranked team's top five. 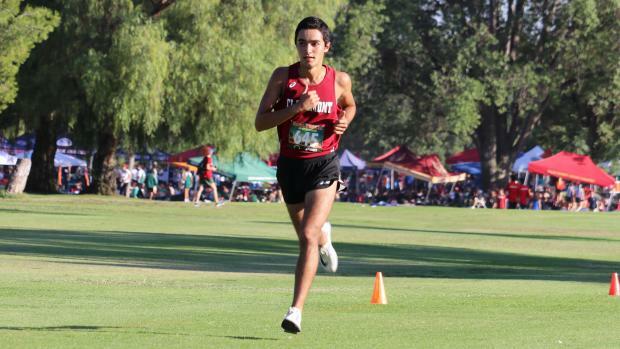 Other boys finishers included: Crescent Valley senior Manan Vats (8th, 14:41.5), Canyon Country Canyon senior Ethan Danforth (16th, 14:51.1) and Cathedral junior Tyriq Granillo (20th, 14:56.2). Claremont also got division team wins in JV Girls Large School, Sophomore Girls Large School, and JV Boys Large School. Bonita picked up team wins in Varsity Girls Unseeded and Varsity Boys Unseeded. Palos Verdes won JV Girls Small School, JV Boys Small School and Sophomore Boys Small School. Corona Santiago won Freshman Girls Large School and Freshman Boys Large School. In winning the JV Boys Large School race, Claremont junior Adam Trafacanty put up a winning time of 14:58.2 worthy of varsity competition. The next best winning time among boys divisions other than the Varsity Seeded was the 15:12.3 posted by Bonita's Raen Reyes in winning the Varsity Boys Unseeded race. The best girls time other than the Varsity Unseeded race was the 17:05.6 clocked by Claremont's Maddie Coles in winning the Freshman Girls Large school race. 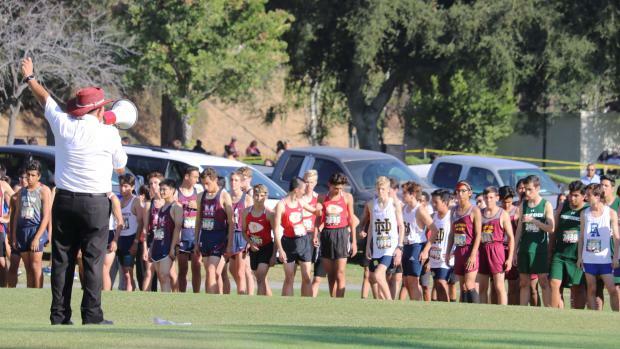 Claremont also got individual race victories from Annette Hermelin in JV Large School (123.8), Lily Widrig in Sophomore Girls (18:40.4), Antonio Diaz in Sophomore Boys Large School (15.36.9).